NEW YORK CITY, May 17, 2017 – The seventh annual international Campagnolo GFNY World Championship NYC rolls out this Sunday, May 21, 2017. 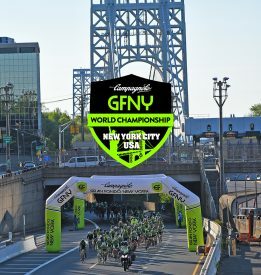 The founding race of the GFNY Global Cycling Marathon Series, the Campagnolo GFNY World Championship represents the pinnacle of GFNY World events. This year, 5000 riders from 97 countries will assemble in New York City to test themselves at the World Championship event. “GFNY World is growing to over 20 races by 2018. Our goal is to have a GFNY near every road cyclist in the world,” says Lidia Fluhme, co-founder and President of GFNY. GFNY is where everyone gets to Be a Pro For a Day®. Each year the race draws a spectrum of elite racers, celebrities and enthusiasts including CEOs, firefighters, teachers, persons with disabilities and many others passionate about the sport of cycling. It is a race where elite racers challenge for glory but it is also an endurance challenge about pushing limits, achieving personal goals and creating stories. Campagnolo GFNY World Championship attracts celebrities from all areas of sports and television. This year former Tour de France Stage winner, Mexican Raul Alcala, Nelson Vails, retired road and track cyclist, NFL stars Amani Tooner, and Tony Richardson, former Brazilian F1 driver Luciano Burti, and actor Sean Ringgold to name a few line up in the VIP corral. On Sunday, May 21, riders will take on a challenging 100-mile route with 8,500 feet of climbing starting on the New York City side of the iconic George Washington Bridge at 7 a.m. and wind through the course in New Jersey and New York State that extends up at New York’s Bear Mountain State Park, with the finish line in Fort Lee, NJ. 15% of the field takes on the non-competitive 50-mile GFNY BEAR, a test that many riders use as a stepping-stone for tackling the GFNY 100 the following year. All the action will be broadcast LIVE on Facebook from 06:00AM to 16:00PM EST on www.facebook.com/granfondony. One of the places to catch all the action and cheer on friends and family is Bear Mountain. Arrive early and watch riders beat the mountain between 8:30am – 11:30am near Bear Mountain Inn. The GFNY Welzome Zone & Café in Fort Lee will provide the perfect Campagnolo GFNY World Championship festive atmosphere to welcome riders home, recover and refuel. Since 2012, GFNY administers in- and out of competition doping controls that ensure a fair competition. GFNY was the first amateur event to hold out-of-competition controls (=not on race day). These controls are critical to serve the surprise element. GFNY CEO Fluhme is also a Board Member of USA Cycling Federation’s Anti-Doping Committee. All funds donated or raised for the GFNY Community Fund via More Than Sport in the build-up to the Campagnolo GFNY World Championship will be going towards making a difference in the communities that neighbor the GFNY course and organizations that also support GFNY and GFNY riders. New for 2017, the GFNY Welcome Zone & Café will be open from Thursday, May 18 to Saturday, May 20 from 8am – 3pm each day at the GFNY Finish Village in Fort Lee. It will serve as a gathering place for riders before or after a ride on the GFNY course. The GFNY Café and Welcome Zone will also be open on race day, Sunday, May 21 from 8am – 6pm to welcome spectators, and families and friends of GFNY cyclists. The seventh annual New York City Bike Expo will take place on May 19-20, 2017 from 11am-7pm (Friday) and 11am – 6pm (Saturday) at Penn Pavilion, 401 Seventh Ave between 32nd St & 33rd St (401 Seventh Avenue). GFNY World events, race sponsors and other vendors will be on hand to showcase their latest offerings. The expo is a stand-alone event organized by GFNY that is open to the public and draws nearly 15,000 visitors. GFNY WORLD events bring GFNY Cycling to other fantastic destinations. A similar rider and family experience and a common set of rules are the foundation of GFNY. Riders have a chance to qualify for the elite racer corral at the GFNY World Championship in NYC by placing in the top 10% of their age group at a GFNY World race and in the top 20% at regional championship races.